And we predict you will be as well. From 2002 until 2009, the Kia Sorento was a body-on-frame SUV. Today it’s a crossover and we think it happens to be one of the best non-luxury CUVs you can buy. Now in its third generation, the Kia Sorento is a mid-size, three-row CUV that's literally been tailor-made for Americans. We recently tested a fully-loaded, nearly $47,000 Sorento SXL V6 and were nothing less than impressed with the overall package. Power comes from a 3.3-liter V6 with 290 hp and 252 lb-ft of torque sent to all four wheels via a six-speed automatic. Quick bit of advice: go for the optional all-wheel drive if you can. We experienced noticeable body roll and it would have been more prevalent with the standard two-wheel-drive. But where the Sorento really shines is its bang-for-the-buck factor and what we like to call its "affordable luxury" persona. If it weren’t for the Kia badge up front, our passengers figured they were riding in something considered luxury. With its Ivory Nappa leather trimmed seats, dual-zone automatic climate control, panoramic sunroof, and heated and leather-wrapped steering wheel, the Sorento SXL V6 is a wonderful package. 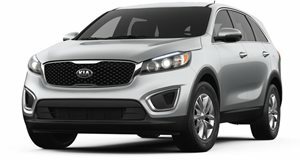 For those who can’t swing its $46,495 sticker price, Kia offers the Sorento in six lower trims, with a starting price of $25,600. Point being, there’s a trim available for almost every budget. Like the excellent Optima sedan we previously tested, the Sorento is yet another clear sign of Kia’s ability to design, engineer and sell premium vehicles that don’t force buyers to pay more for a luxury nameplate. It looks and costs as much, but is that enough to fight Lexus? The old Sorento was a big hit for Kia. Can the latest one carry on that impressive trend? Kia's three-row crossover just keeps getting better.